The forehead of a disembodied man inflates and morphs as if via telekinesis, as an organic form appears to grow from beneath his skin. 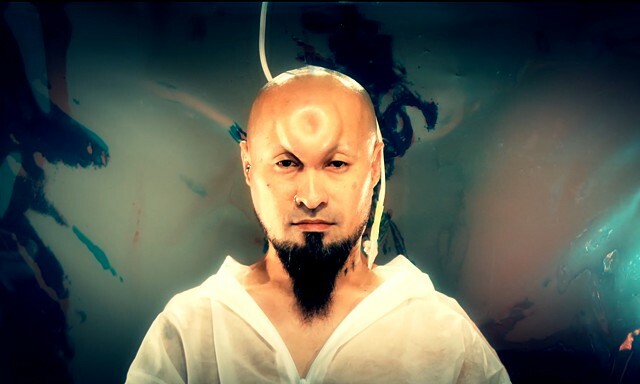 In an era in which modification of the body is scientifically and bio-medically altering ideas of what it means to be human in a technologically mediated world, ‘Shifters’ explores the uniquely Japanese underground body modification ‘bagelhead’ trend of manipulating the body through saline infusion. Engaging ideas of transformation, metamorphosis and transcendence through human symbiosis with technology, ‘Shifters’ simultaneously questions the relationship of technology to cultural self-expression. ‘Shifters’ was filmed on location in Tokyo, with members of Tokyo’s body-modification subcultures, with whom the artist met through research while on Residency at Tokyo Wonder Site. This work was generously supported by Asialink; The Australia Council for the Arts; and Arts Tasmania.